Last night, I was babysitting three of the most adorable children in the whole world. After PB&J, baths, Berenstain Bears and bedtime, they were asleep, so I had the evening to myself. I settled into the couch, ready to watch a new movie. 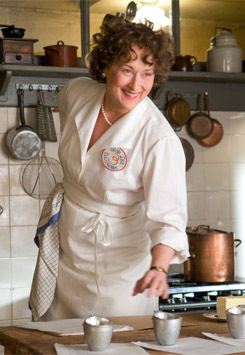 Julie and Julia. Julia Child was just a name before I spent 2.5 hours getting to know her. She is now my new favorite person. I think that if I had to choose one word to explain her, I would choose the word personality. Julia was honest, bold, larger-than-life, and absolutely lovely. Personality is a funny thing. It's a kind of honesty, I think. Or at least it is honesty that lets a personality come out and be seen. It's awfully easy to hide the quirks, the desires, the thoughts, the laughter, and just float along with the tide. It takes boldness to stand out, to swim upstream, to listen to your own music and march to it. When Julia Child move to Paris with her husband, she had to find something to do. She turned down hat making and bridge playing because she wanted to cook. She loved food. Loved cooking. Loved baking. Loved eating. She just didn't like bridge. Or hats. At least, not enough to make them. Julia in front of her stove has the same fascination for me as watching a kettle drummer at the symphony. The oven door opens and shuts so fast, you hardly notice the deft thrust of a spoon as she dips into a casserole, and up to her mouth for a taste check like a perfectly-timed double beat on the drums..."
It is fascinating when a person is so free and comfortable in their own skin that they can come alive. Layers of depth and character open up, blossom and glow. And that depth and character belong singularly to the person, more individual and personalized than a fingerprint. A person's personality is completely his own. Singular, unique and irreplaceable. Personality is a bit of a mystery. By being honest, there is supposed to be so much more clarity. You are laid bare and wide open so that the people around you can get to know and appreciate and understand you better. Yet, the more that you know about a person, the less that you can pin then down, define them, or put them in a box. It's fascinating and wonderful at the same time that you can never completely know someone. People are mysteries, but somehow, mystery is not quite the right word. Mysteries can be solved. People are not mysteries because people cannot be solved. We are not puzzles. Perhaps we can get hints, clues - but no keys. I think that this experience of wonder is the right response to meeting another human being because people are exactly that - unfathomable and inexhaustible. That's the depth and richness of personality. We can never see the world exactly through another person's eyes - there's no magic algorithm that can give us another person's glasses - we all see the world from an irreplaceable vantage point, a phenomenon called subjectivity. I suppose the bottom line to all of this - receive other people with a curious wonder. But at the same time, realize that we are each wondrous creatures too.